KING CREOSOTE-ASTRONAUT MEETS APPLEMAN-LIMITED EDITION DELUXE VINYL VERSION. Since 1995, Kenny Anderson has been a one man music making machine. He has released over forty albums under a number of aliases, including the Skuobhie Dubh Orchestra, Khartoum Heroes, Kwaing Creasite and Jokes. That however, is just part of the Kenny Anderson story. Kenny Anderson is also a member of Kid Canaveral, and the Scottish-Canadian folk band The Burns Unit. However, most people know Kenny Anderson as King Creosote, who have just released a new album, Astronaut Meets Appleman on Domino Records. It’s available in a variety of formats. As well as a the usual CD and digital download versions of Astronaut Meets Appleman, it has also been rereleased on heavyweight vinyl. There’s two versions, the ordinary version, and the Deluxe Version. It comes complete with a single sided 10″ LP which features the song The Long Fade. However, also included in the Deluxe Version, is a signed art print. There’s no doubt album it that the Deluxe Version of Astronaut Meets Appleman is a quality release. Astronaut Meets Appleman is the much-anticipated followup to 2015s Småvulgär, and a welcome addition to King Creosote’s burgeoning back-catalogue. Quite simply, the King Creosote back-catalogue is a veritable musical feast, fit for a king. There’s plenty of tasty treats awaiting discovery within King Creosote’s back-catalogue. Most of these albums were released on Fence Records, which King Creosote founded in 1995. By 1995, singer-songwriter Kenny Anderson was twenty-eight, and living in Anstruther, a small fishing village in the East Neuk of Fife. He was a familiar face within the Scottish music scene. For some time, Kenny Anderson had been contemplating founding his own record label. However, this was a big step and not one to be taken lightly. Eventually, though, Kenny Anderson and Johnny Lynch of The Pictish Tail decided to take the plunge, and founded Fence Records. Most new labels would’ve been based in Glasgow or Edinburgh, where much of Scotland’s music industry was based. However, city life wasn’t for Kenny Anderson. Instead, he decided to base Fence Records in the place he called home Anstruther. Over the next twenty years, Anstruther would become synonymous with its most favourite resident, King Creosote. By the time Fence Records had been founded, Kenny Anderson had adopted another moniker, King Creosote. Little did Kenny realise that King Creosote would become one of the most profile artists in the history of Scottish music. Just three years after dawning the King Creosote moniker, Fence Records released its first album, Queen Of Brush Country in 1998. 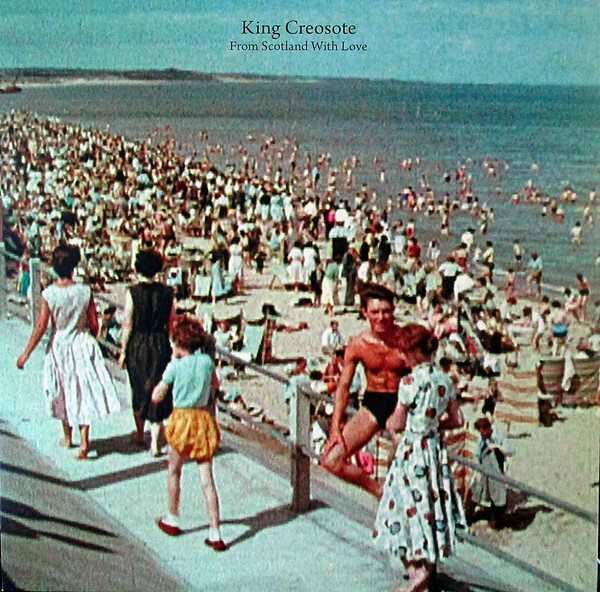 This was the debut album from King Creosote. It was released on CDR, and nowadays, is a much prized collector’s item. So are many of King Creosote’s albums. This includes the rest of the albums King Creosote released during 1998. This includes Rain Weekend, Inner Crail To Outer Space, Or Is It? and Gink Scootere. By the time 1998 drew to a close, King Creosote had released five albums. He was a truly prolific and inimitable singer-songwriter. As 1999 dawned, King Creosote continued to release albums with regularity. 1999: An Endless Round Of Balls (Parties and Social Events) was King Creosote first album of 1999. It was followed by Wednesday, Jacques De Fence and I Am 9, Fence Records’ ninth album. Soon, though, nine became ten when King Creosote released Planet Eggz. Just like all the other albums, it showcased King Creosote’s unique and often quirky songs, which were tinged with humour, hooks and social comment. King Creosote had come a long way in just a couple of years. With the new millennia dawning, King Creosote seemed determined to steal James Brown’s crown as the hardest working man in music. Or Was It? was King Creosote’s first album of 2000. Soon, though, 12 O’Clock On The Dot and Stinks followed. This meant King Creosote had released thirteen albums in just three years. By then, King Creosote was maturing as a singer, songwriter and storyteller. His carefully crafted songs were beginning to find a wider audience. G was the first album King Creosote released during 2001. It was one of the best albums the Fife-based singer-songwriter had released. King Creosote seemed to draw inspiration from a variety of sources, on what was a captivating album. Soon, though, King Creosote was back with a very different album, Radge Weekend Starts Here. This was followed by King Creosote Says “Buy The Bazouki Hair Oil.” However, King Creosote’s fourth album of 2001, was Disclaimer, which was another of his finest albums. 2001 had been a busy and successful year for King Creosote, having released five album and been busy playing live. 2002 would be just as busy. King Creosote released a limited edition, five disc box, Squeezebox Set. It featured Fair Dubhs, Favourite Girl, Whelk Of Arse, More Afraid Of Plastic and Losing It on the Gyles. These five albums meant that Fence Records had released twenty-two albums since 1998. They had all been released on CDR, but from 2003, things began to change at Fence Records. For some time, record companies were watching the progress of King Creosote with interest. They were keen to add the singer-songwriter to their roster. Despite this, King Creosote wasn’t willing to turn his back on Fence Records. So Domino Records came up with a solution. King Creosote’s albums would be released via Fence Records and Domino Records. It was a deal that gave King Creosote the best of both worlds. He was still signed to an independent label, while Domino Records had the financial muscle and expertise to promote and release King Creosote albums in different territories. Soon, King Creosote would be going global. King Creosote’s albums would be released on CD, LP and as digital downloads in 2003 when Fence Records joined forces with Domino Records. In the short term, Fence Records continued to release albums on CDR. During 2003, King Creosote released Now (Nearly 36), Psalm Clerk and Ideal Rumpus Room Guide on CDR. However, King Creosote also released Kenny and Beth’s Musakal Boat Rides in 2003. It was the first album to be released by Fence Records and Domino Records. Kenny and Beth’s Musakal Boat Rides was the album that also introduced King Creosote to a much wider audience. This was the start of the rise and rise of King Creosote. While many artists would’ve concentrated on albums that could be released worldwide, King Creosote released several albums on CDR during 2004. This included Sea Glass, Red On Green, Three Nuns and Kompanion Çet +1 in September 2004. King Creosote also released Loose Tea On His Wynd, a limited edition LP. There was no sign of King Creosote slowing down. It was if he was making up for lost time. King Creosote had released his debut album in 1998, when he was thirty-one. Since then, he had been averaging four and five albums each year. 2005 was no different. Balloons was released on CDR, and marked the end of an era. No further CDR albums were released. However, King Creosote was just as busy as ever. Rocket D.I.Y was released on April 4th 2005, and immediately hailed one of King Creosote’s best albums. When Vintage Quays was released later in 2005, it was the thirty-fourth album that Vintage Quays King Creosote had released. That number soon rose to thirty-five when KC Rules OK was released on September 19th 2005. It featured songs penned between 1999 and 2003. These songs captured the hearts and minds of critic and record buyers, and would soon be regarded as one of the finest albums in King Creosote’s back-catalogue. 2011 was another busy year for King Creosote. He released his solo album Thrawn, and then collaborated with Jon Hopkins on the album Diamond Mine . It was released in 2011, and was later nominated for the Mercury Prize. This played a part in King Creosote’s music reaching a much wider audience. This just happened to coincide with King Creosote hitting a rich vein of form. On April the 21st 2013 King Creosote returned with a rerecorded version of one of the hidden gems in his back-catalogue, That Might Well Be It, Darling, It was originally an acoustic album, but King Creosote decided to rerecord the album with a full band. King Creosote spent six months working with producer Paul Savage at the Chem 19 studio, in Blantyre. Critics believed that this was time well spent. The newly rerecorded version of That Might Well Be It, Darling ,many critics felt, was the best album of King Creosote’s fifteen year recording career. However, wasn’t the only album King Creosote released during 2013. Later in 2013, King Creosote released the album Sure and Steadfast. It was album that King Creosote had released to raise funds for the Scottish Fisheries Museum, in his home village of Anstruther. Despite being one of Scotland’s top recording artists, King Creosote hadn’t forgotten his roots. Further proof of this came in 2014, when King Creosote released From Scotland With Love, which was the soundtrack to a documentary feature film directed by Virginia Heath. The film was commissioned as part of the Cultural Festival, which accompanied the 2014 Commonwealth Games in Glasgow. King Creosote seemed to have embraced the From Scotland With Love project, and had written and recorded some of the best songs of his career. Critical acclaim accompanied the release of From Scotland With Love, which was heard by a global audience during the 2014 Commonwealth Games. During the Commonwealth Games, a screening of From Scotland With Love took place on Glasgow Green, with King Creosote playing live. That night, an audience from the four corners of the globe were captivated and spellbound by King Creosote’s music. It was a far cry from the days when he was Scottish music’s best kept secret. Despite releasing the most successful album of their career, King Creosote returned with another limited edition, vinyl release on Fence Records. 3 On This Island was released later in 2014, It may not have been as high profile a release as From Scotland With Love, but it featured nine carefully crafted songs. So did the followup, Småvulgär. It was released in 2015, on Fence Records. Just like 3 On This Island, Småvulgär featured carefully crafted song which showcased the considerable talents of the truly talented trio. However, their next album, Astronaut Meets Appleman would see King Creosote return to the global stage. Having just released one album, it wasn’t long before King Creosote began work on his next album. For the new album, King Creosote wrote ten new songs. They would become Astronaut Meets Appleman, the forty-sixth album from the uber prolific King Creosote. Recording of Astronaut Meets Appleman, King Creosote took place at various studios across Scotland. Recording of the latest addition to the King Creosote songbook, Astronaut Meets Appleman took place between July 2015 and February. The sessions began at Analogue Catalogue in July 2015. Then the band headed to Gordon McLean’s at An Tobar, where recording took place between September and October 2015. To complete Astronaut Meets Appleman, King Creosote hooked up with an old friend, at Paul Savage at Chem 19 studios. Paul Savage was no stranger to King Creosote, and had worked with them several times at Chem 19, on some of their best and most successful albums. This was no surprise. The producer and former Delgado drummer, was now one of the most experienced Scottish producers. He was sure to bring out the best in King Creosote, who made their way to the Blantyre studios. When King Creosote arrived at At Chem 19, Kenny Anderson brought with him his trusty acoustic guitar, accordion, xylophone and synths. He would also play piano and add vocals. Joining Kenny Anderson, were the other members of King Creosote, drummer Andy Robinson and keyboardist, pianist and bassist Derek O’Neill. They were joined by some of their musical friends. This included Sorren McLean who played electric guitar, snare drum and vocals. Gordon McLean switched between electric bass, double bass, acoustic guitar and tambourine. Hannah Fisher played violin and added vocals and Mairearad Green on bagpipes vocals. They were joined by cellist Pete Harvey, harpist Catriona McKay and vocalist Amy McDougall. Producer Paul Savage added drums and the sound of a ‘wind turbine; on Melin Wynt. Eventually, after seven months of recording at three different locations, Astronaut Meets Appleman was complete. Now it was ready for release. Astronaut Meets Appleman was one of the most-anticipated albums of King Creosote’s twenty-one year career. Especially, as it became known that Astronaut Meets Appleman was one of the most eclectic albums of King Creosote’s career. The release of Astronaut Meets Appleman was eagerly awaited, as critics and record buyers awaited discovery of the delights within King Creosote’s latest musical feast. You Just Want opens Astronaut Meets Appleman. Just a guitar is played softly, before the arrangement builds. Drums join a chiming guitar, tender harmonies and strings. They provide the backdrop for Kenny Anderson’s inimitable vocal. It’s needy and hopeful, as if he’s lived the lyrics. Especially as he sings: “when you need someone you cry on, in the depths of despair.”Meanwhile, the rhythm section provide the heartbeat to this widescreen arrangement. Instruments are dropped in at just the right time. This includes the swathes of lush cascading strings. They’re joined by a crystalline guitar and drums which never miss a beat. Later, a searing guitar solo, breathy harmonies and harp are added. Musical contrasts abound, on this multilayered seven minute epic which features a musical masterclass from King Creosote and friends. Wake Up To This bursts almost joyously into life, with the rhythm section joining the strings. Soon, a joyous Kenny celebrates “he’s away for all of ten days…the girl from France dances on the tip of your tongue.” Behind him, the band join in this joyous, celebratory song. An accordion joins keyboards and guitars. As usual, the drums anchors the arrangement, while Kenny delivers one of his best vocals. Especially when he’s joined by harmonies and strings, as this anthemic track reaches a joyous ending. The tempo drops on Faux Call, with the wistful sound of strings while Paul Savage’s drums provides a maudlin heartbeat. When Kenny’s vocal enters, it’s tinged with sadness and regret. Soon, he’s delivering a tender, soul-baring vocal. Meanwhile the rhythm section have been joined by acoustic guitar, banjo and strings. They’re the perfect accompaniment to Kenny’s vocal, which literally oozes emotion. Later, when his vocal drops out, a harp is added. It’s a masterstroke, and plays its part in what’s a truly beautiful, soul-baring ballad. Kenny’s vocal on Betelgeuse sound distant, as a djembe and cello add a melancholy backdrop. Soon, though, Kenny’s vocal is moved forward in the mix and grows in power. Still though, his vocal is tender and tinged with emotion, as a chiming guitar rings out. It accompanies the strings and djembe as the rhythm section anchors the arrangement. Again, everything is added at the right time, including the keyboards. They help frame Kenny’s heartfelt vocal, before it drops out, When it does, King Creosote and friends get the opportunity to showcase their considerable skills. This they do before Kenny returns, and as a guitar chimes, has the final word on this slice of perfect folk-pop balladry. Accompanied by his trusty acoustic guitar, Kenny steps forward and delivers the vocal on Love Life. Straight away, there’s a spring in his step as he reminisces about a femme fatale of his acquaintance. Meanwhile, the rhythm section underpin the arrangement as strings and harmonies accompany Kenny’s vocal. They create the perfect backdrop for a vocal that veers between joyous to cautious. Later, when his vocal briefly drops out, a chiming guitar makes a fleeting appearance. Then when Kenny returns, he and the rest of King Creosote seamlessly combine to create a joyous hook laden paean. Peter Rabbit Tea is very different to the previous tracks, but finds King Creosote at their most inventive. They combine dark, almost sinister strings with a recording of a baby constantly saying: “Peter Rabbit Tea.” This is only part of the story. King Creosote deploy the rhythm section, keyboards, a harp and an accordion. Together they combine to create a track that’s variously cinematic, eerie but sometimes, joyful. An lone acoustic guitar is joined by a chiming, reverberating guitar and piano on Surface. They provide the backdrop for Kenny’s urgent vocal, as the arrangement takes on a rocky sound. The rhythm section power the arrangement along, as guitar cut through the arrangement. It features keyboards, synths and harmonies that accompany the vocal as the song heads into anthem territory. When the song reaches the bridge, guitars are to the fore before there’s an unexpected twist. That’s the addition of bagpipes, which sit well in the mix. They might seem a strange choice, but they’re used sparingly, before King Creosote and their “invisible friend” kick loose, as they return to anthem territory. Closing Astronaut Meets Appleman is Rules Of Engagement. It finds the tempo dropping, as a harp and strings combine to create a wistful backdrop for Kenny’s vocal. It’s almost maudlin, while he sounds almost defeated, as he lays bare his soul. Then at 1.46 the song almost grinds to a halt, before what sounds like a radio playing in the distant is accompanied by the harp. At 3.07 the harp drops out, and all that remains is a myriad of subtle sounds that meander along. 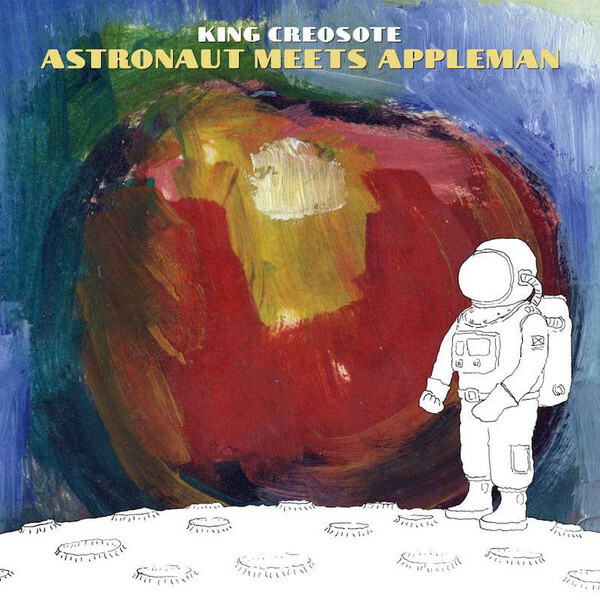 Soon, all that remains of Rules Of Engagement, and indeed Astronaut Meets Appleman are the memories of what’s one of King Creosote’s finest albums. That’s no exaggeration. Astronaut Meets Appleman which is King Creosote’s forty-sixth album, is without doubt, one of the best albums of a twenty-one year career. During that period, the chameleon-like King Creosote have become one Scotland’s top bands. Anyone wondering why, just need listen to Astronaut Meets Appleman. It’s one of the most eclectic albums of King Creosote’s long and illustrious career. They combine elements of folk, indie rock, perfect pop and psychedelia on Astronaut Meets Appleman. It features balladry, paeans, rockers and hook-laden anthems. King Creosote are equally happy delivering ballads, as they’re heading into anthem territory. That’s no surprise. Kenny Anderson’s worldweary voice is perfect for the ballads on Astronaut Meets Appleman. Then in an instant, Kenny’s transformed, and is delivering hook-laden and rocky anthems. He’s Mr. Versatile. However, King Creosote isn’t a one man band. Far from it. Drummer Andy Robinson and Derek O’Neill who played keyboards, piano and bass both play vital roles on Astronaut Meets Appleman. Their contributions can’t be underestimated. Nor can the contribution of King Creosote’s musical friends. Especially the strings, harmonies and drummer and co-producer Paul Savage. He co-produced Astronaut Meets Appleman with King Creosote, and has obviously played an important part in the widescreen, multilayered arrangements. Each arrangement builds gradually, with instruments being dropped in at just the right moment. Paul Savage helps to ensure that each piece of this musical jigsaw is put into the right place. This is definitely the case, with each of the nine songs on Astronaut Meets Appleman making perfect musical sense. Sometimes, an unlikely instrument is deployed, including a harp or bagpipes, but they’re addition compliments the arrangement, and in some cases, adds the finishing touch. However, Paul Savage’s other contribution came at the mixing stage. Rather than send the completed album to a mix engineer in London or New York, Paul Savage was asked to mix Astronaut Meets Appleman. That made sense, as he had played an important part in the Astronaut Meets Appleman project. Having placed their faith in Paul, he rewarded King Creosote with a masterful mix where the music on Astronaut Meets Appleman comes to life. The result is an album that’s a fitting followup to From Scotland To Love, which was King Creosote’s previous release on Domino Records. Småvulgär which although was King Creosote’s previous album, was only released on Fence Records. Astronaut Meets Appleman was released by Fence Records in conduction with Domino Records. It’s a welcome addition to King Creosote’s burgeoning back-catalogue. It now numbers forty-six albums. However, for a newcomer whose yet to discover the delights of King Creosote, where do they start in this glorious, veritable musical feast? A good starting point is From Scotland To Love and Astronaut Meets Appleman, which are a tantalising taste of the inimitable King Creosote, who after twenty-one years and over forty albums, are belatedly receiving the critical acclaim and recognition that their music so richly deserves. KING CREOSOTE-ASTRONAUT MEETS APPLEMAN-VINYL EDITION. ← ARBEIT SCHICKERT SCHNEIDER-A S S.